Camels will be racing for money for the first time on Camel Cup Day in Alice Springs next month, and their owners are loving it. For a couple of years local firms Dennis Orr Camels, and Neil Waters from Camels Australia at Stuarts Well, provided just about the whole field. But this year’s purse of $19,000, spread over the nine races, is luring owners from Victoria, SA and WA to the starting line. Peter Hodge, formerly from Alice, is bringing four camels, with “some sponsorship from Centre Bush Bus and Kurt from Ayers Rock Autos,” he says. Organiser Steve Langdon, from the Apex Club of Central Australia, says Uluru Camels will be there, plus a lady racer with another four camels from the Mid North of South Australia, and most likely an owner from Broome. It’s likely to be enough to run an interstate challenge, says Mr Langdon. This will be the second year Apex is organising the day, again with help from Lions who’ve run the event for decades. It was started in 1970 in the dry Todd River bed as a bet between two mates, Noel Fullerton and Keith Mooney-Smith. 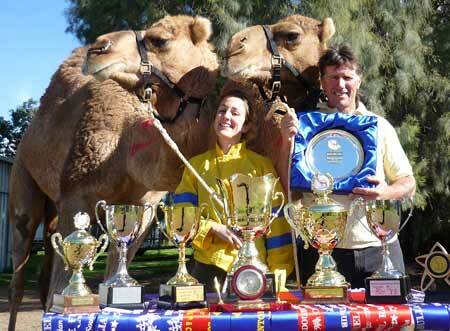 The fixture, now called the Lasseters Camel Cup, in 2011 raised $63,000 for charity, and $51,000 in 2012. The date is Saturday, July 13 at Blatherskite Park. Photo: Trophies won by Peter Hodge on the Queensland circuit. The jockey is Rachael Woodham who lives in Gembrook, Victoria, and will be coming to race for Mr Hodge in Alice Springs.